Prevent spills by using drum racking containment. Components allow you to organize a wide variety of combinations to suit your exact needs. Drum racks are ideal for the storage and dispensing of oils, paints, inks, detergents, acids, alkalis and other aggressive chemical. Our storage racks are characterized by their versatility, as the assembly shelves and spill trays can be combined to suit individual applications. 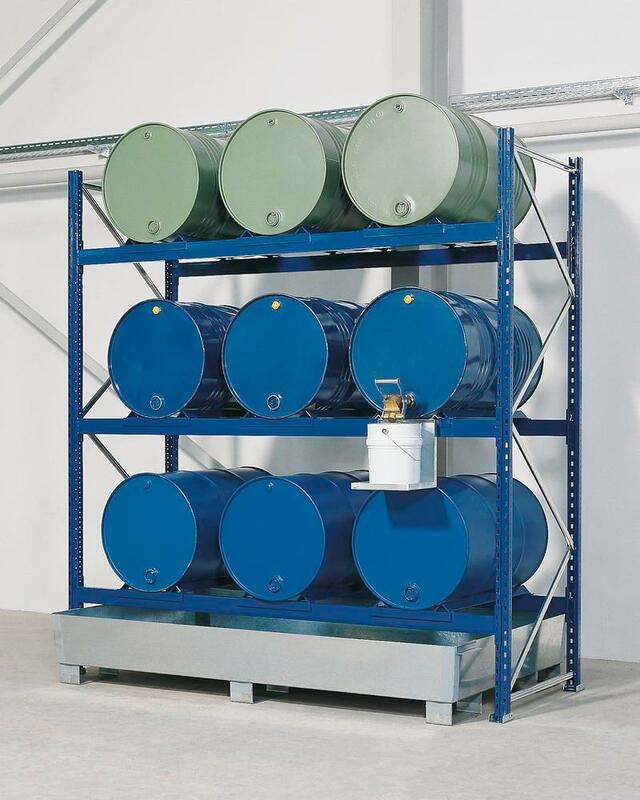 Drum racks are ideal for the storage and dispensing of oils, paints, inks, detergents, acids, alkalis and other aggressive chemicals in and out of barrels. The storage racks can be transported using a forklift truck. Up to three drum storage racks can be stacked on top of each other. Depending on the nature of the stored substance steel or PE spill trays can be supplied with the drum racking system for below the shelf to ensure safe dispensing. The drum racks are made of a robust steel construction and are easy and quick to assemble. The range of hazardous substances shelves that DENIOS offer is designed to suit a wide variety of uses. Stackable racks and drum racks are used in all applications where hazardous substances in drums and small containers must be stored and dispensed safely.